The user-friendly professional control panel puts everything at the operator’s fingertips. A built-in hourmeter tracks the unit’s run time to make preventative maintenance scheduling easy. Get the precise voltage control needed for sensitive electronics with the Automatic Voltage Regulation system. The high surge capacity capably handles equipment as it powers up. A two-wheel kit with fold-down handles makes transport easy. The easy-to-access fuel shut-off valve locks for movement and maintenance. The full tubular wrap frame protects the generator from damage. OSHA-compliant Ground Fault Circuit Interrupter (GFCI) receptacles make plugging in safe and easy. The AC circuit breaker automatically interrupts the current flow when it exceeds the breaker’s trip rating, protecting the equipment. The large fuel tank and easy-to-read fuel gauge keep you going without multiple stops for fuel checks and fills. High-performance alternators use full copper windings for long-lasting performance. 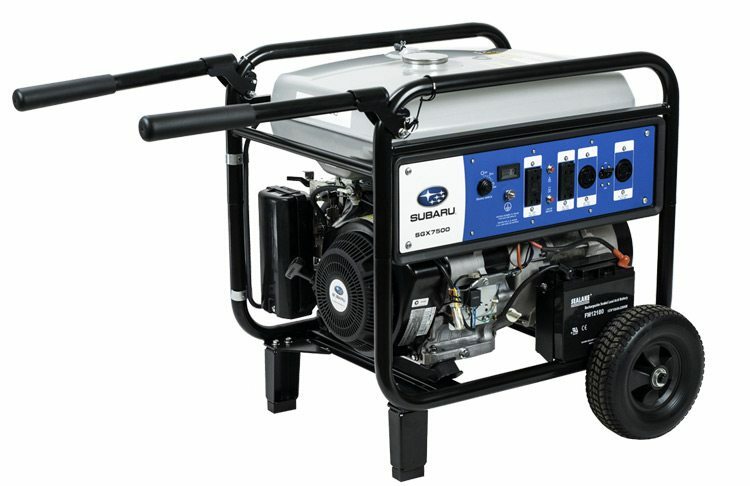 The built-in low-oil shutdown mechanism automatically protects the generator. Unbreakable recoil that withstands the weight of a semi-truck. Subaru OHC engines used on all generator models.